Well, this post won't be optimistic one and before describing the problem, i want to thank all of you for the support i got since game was release till the point we're standing at the moment. I've been thinking quite long time (about whole last week) to post it or not, but we all decided that i'll share with you all the info about development and my plans, so i'll be honest with you till the end. For me it's very hard to write all this, i really love KINGDOMS and all this situation is just driving me mad. I'll try to describe the problem step by step so you can see full picture. It was probably the most hard year in my life, full of stress and crunches - but i hoped that the result will worth it. It was released in October 2018 and by that time i was full of optimism to move forward. The plan was to release stable updates every month after conversing the game and it's perfectly working - there were 3 major updates since that time. I really hope that they were full of content and most of you enjoyed new stuff. As you know KINGDOMS is my full time work, not a hobby - i'm single indie developer in full meaning of this word, i'm working at home, i've left my job (I was working as a German teacher in school) to give all my time to my dream project. It made me, my wife and my 5-yo son fully dependend on KINGDOMS success. Since summer Steam changed something in search and recomendation logic - Steam started to show AAA titles as recommended on various pages, some game couldn't set sales properly, search didn't show games correctly etc.etc. As result the income of almost indie developers on Steam was about X10 worse than usual. (You can find some posts on Reddit written by indie developers, not trash ones but rather professional). I was thinking that my personal low income was connected with my own stupidity (closing Communty and banning in summer) , but i was surprised that not only me experienced same problems. My average income in last 4 month was about ~500$ per month, and during this time i was told to myself "Everything is fine, just work hard, deliver good updates and things are gonna be better". The problem is - things are worse. (Worse than 500$ pro month) My plan now is to wait next 2-3 month (updating the game monthly of course) and watch the dynamic - if things will change, then game will be finished in full scale as initially planned. If not - in last update i'll fix the most annoying bugs and will release the game out of EA. (For me it will be the death of my beloved child). Another problem are reviews. That's one more thing that was probably changed by Valve in summer - now even after one single negative review your sold copies will be zero. For example, one day last review rating was 78% and game got 15 sold copies (the best result actually for last month, i started to believe that things are gonna change), but the next day after one single negative review game got zero sold copies (by 75% positive rating, positive rating = 0 copies). Sometimes reading reviews i'm just thinking that the game is the buggy crap and no matter what i'm adding or fixing it will be crap and trash. Many reviews are the only ones from the account so the game is really bad if the person decides to write first review for unfinished EA title. After reading positives ones i'm usually get back to normal, but then at some moment i'm getting bunch of negative stuff and circle repeats. That's really hard not to mention it, but i'm trying to keep positive. Maybe single-player is truly dying and only AAA titles can survive massive PVP madness, don’t know. Hope we're all adult people here and all of you understand that my family can't just eat air, we fully depend on Kingdoms income. Again, i want to repeat that the game will be finished anyway, so i won't just say "F*** it" and leave without any explanation. So 2-3 month i'll be with you for sure. I don't think that this post will change anything but at least i shared all my thoughts and concerns with you. KINGDOMS Politics update is coming! Info about politics system and it's work, AI imrovements, release date. Huge news about 3 Update. Development news; Art department news; Modelling department news. Crafting update is coming soon! 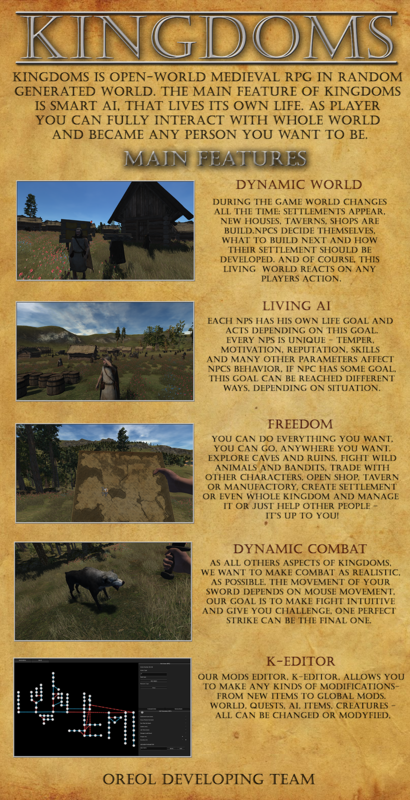 Crafting system; new houses, taverns, smiths and manufactories; new interface is on it's way; some other changes. First update is coming soon! Today we'll tell you about new fatures of upcoming update: survival elements, crafting system, farms. I like this game! It's very complex and shows great potential. I believe you made something worth while and i am keeping my fingers crossed for you success! You can always join Keen Software House, help with medieval engineers and make that game into something that has a goal. It is a fun game, but i misses the complexity your game offers. Your game has so much potential. So... what happened to the update? Anyone know why this team seems to have went walk-about? I just downloaded this game and I have brought up the give item window somehow and now I can't get it off my screen. LOL! Is anyone able to help with this? Store.steampowered.com There will be bugs like that until he updates tbh I would buy the one on steam it is more stable and playable. idk if I answered your question but yeah info is there if I did not.